Plenty to see this week. 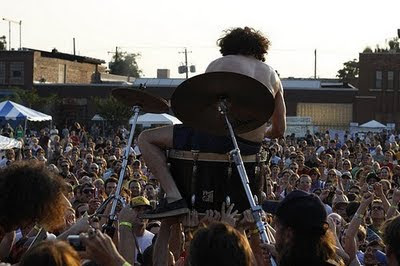 If you think you've got strong enough muscles and an air of invisibility about you, why not check out the drum kit surfing Monotonix at the Garage. I'm not really built for this kind of gig. In most of the photos I've seen of this guy it seems the audience are either carrying him playing his drums or taking photos of him - does he not stand on you if you have a camera pointed at him? Seems like a good move. If you prefer not being crushed by a crowd surfing drum kit plus drummer why not check out BETHAN ELFYN’S LUNCH CLUB AND MINI-BOOT on Tuesday - apparently you get free sandwiches as well! Noah and The Whale will be playing a free show at Pure Groove later today (Mon 24th) -this is bound to be popular especially with it still being the school/university holidays. If you're a fan I'd suggest you get yourself down there pretty early, Pure Groove will fill up fast. Crystal Antlers at Rough Trade East on Thursday should also pull a good crowd, you'll need to get yourself a wristband one hour in advance for that one. Whatever you get up to, I hope you have a great week. Sorry that the Lafitte case was empty. Yesterday evening I went to Gevrey-Chambertin, and the pinot noir looks lovely! sounds lovely! Picking up 12 more cases tonight from our fav local french restaurant -empty of course!